The biggest nightmare for a woman is to have facial hair which keeps coming again and again. Trying to remove them through various methods can even cause red blotches on the skin to make them pretty obvious. To your surprise, although home remedies may take time to show positive results for hair removal, they are generally safe and do not have any side effects. Natural home remedies have been proven effective for sensitive skin types and normal skin too. You should choose the method that suits you the best based on your skin type and preference for ingredients. However, it is recommended to do a patch test on a small area of your skin to see if the ingredients suit you without causing redness or soreness. Sugar and honey has been an ideal combination for hair removal since ages. Sugar sticks onto the hair and can easily be ripped off the skin when dried. This causes less discomfort than wax as it has to be heated to a higher temperature. Lemon has bleaching properties which lighten the skin tone. It also gives its refreshing aroma to the mixture. Apply the mixture thrice a week to have positive results after a couple of weeks. Honey has similar properties to that of sugar and is safer than chemical hair removal products. The mixture should be used 2 to 3 times a week for best results. This method is best for dry skin as honey has moisturizing properties. Oatmeal and banana make the best scrub for a glowing skin. You should apply the mixture once every week. Oatmeal is rich in antioxidants which reduces itching and makes your skin soft, smooth, and hydrated. Having oatmeal mixed with honey and lemon will benefit your skin even more with the properties of all ingredients. Rub the mixture against the direction of hair growth and you will be able to see positive results in a couple of weeks. Turmeric has healing, antibacterial, and antibacterial properties which can help treat wounds. 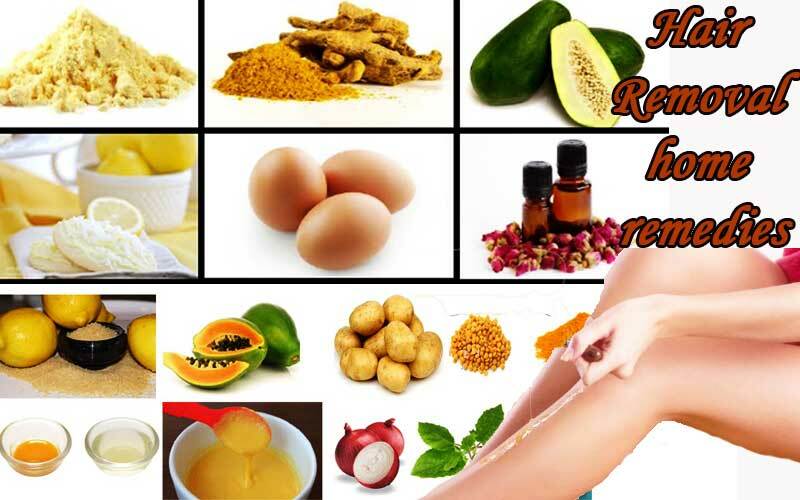 Ads ground oats or gram flour to the mixture of turmeric and rose water for thick hair removal. You may also add milk in place of rose water if you have dry skin as milk will act as a natural moisturizer. Eggwhites are perfect for hair removal as they dry to form a thin layer on the skin to peel off easily. Sugar should also be added to the mixture of egg white and cornstarch and mixed thoroughly to apply the paste at least 2 or 3 times a week. This is not effective remedy for sensitive skin and acne prone skin as egg white contains vitamin A which may cause breakouts by clogging pores. Alum is an inhibitor of hair growth and has been in use of Asian women. Although you may need a moisturizer after alum and rose water wax as it may make your skin dry. Apply the mixture at least once a week for nest results. Alum also cools your skin so it is best for use in summers. Papaya and turmeric are both beneficial for skin with their unique properties. Papaya contains an enzyme which helps in dilating hair follicles and preventing them from growing. It is suitable for all skin types. As mentioned earlier, papaya has beneficial properties for skin. Mix papaya paste, aloe vera gel, gram flour, turmeric powder, and mustard oil to make the mask even more beneficial for your skin. Each ingredient will do its best for your skin. Apply the mixture 2 or 3 times a week and do not use soap for washing it off. Rinse with cold water only. This mask works best for women with hirsutism. It will help in removing the dark and coarse hair with the anti androgenic properties. Apply on the areas of hair growth and see the difference for yourself. This is not a suitable mask for acne prone skin and also it can make your skin dry. Take caution while using tea tree oil mask by taking a patch test before application to make sure it does not react with the skin. Apricots are rich in antioxidants and will help your skin in every way. This mask will also pull off the hair that is stuck. The mask may not suit oily skin types as it may cause breakouts so caution should be taken. Unflavored gelatin works best when mixed with milk for instant results. It will also pull out the black heads and stubborn hair. Again, this mask is not suitable for acne prone skin types. The mask is also sticky and gooey which should be peeled off carefully. Oranges and lemons are amazing citrus fruits with several benefits for skin if eaten and applied externally on to the skin. When mixed with oatmeal, it can work wonders for your skin. Although the mask works best in every way possible, it may still not be suitable for sensitive skin. Choose any fruit peel and use it as a scrub regularly. This will weaken your hair follicles and cause them to fall off. While this is not something to apply on hour skin for hair removal, it is known for reducing the male hormones in women causing hair growth. Spearmint tea can work wonders internally as you drink 2 cups every day. Brew spearmint tea leaves in boiled water and leave for 5 to 10 minutes. Drink up when it is warm and you will see the amazing results by reducing hair growth naturally. What Causes Hair Growth in Women? Women are prone to having facial hair and hair in areas where men have it because of several factors. The most common factors include genetic, hormonal changes, stress, menopause, steroid creams, cushing’s syndrome, race, and ethnicity. Relax and release your stress daily as it will worsen your problem of hair growth by producing more testosterone hormone. Healthy healthy and exercise as losing weight can also have a positive impact in lowering testosterone hormone naturally. Applying lemon juice or chamomile on the skin area with hair growth will help to bleach them and make them less obvious. So, whatever the reason for your facial hair growth is, the most effective and easiest home remedies have been shared for you above. Choose the remedy that suits your skin best and it will work wonders for you. It is still advised to see a doctor if the problem persists or hair growth increases as it may need an internal treatment through mediciations. However, natural remedies and healthy lifestyle can always compliment any treatment to have rapid results. Other hair removal techniques including depilatory wax, hair removal creams, shaving, epilating, tweezing, and threading can all be helpful depending on your choice. Although tweezing can make your hair grow thicker later and stimulate hair follicles nearby to grown more hair, it can only be used for smaller areas if necessary. Waxing is the best and most effective method for hair removal which will lessen hair growth.